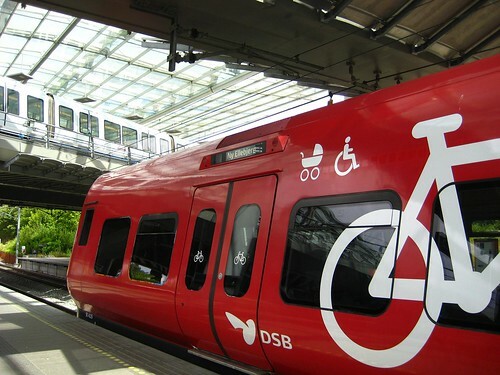 It was announced today that Danish State Railways [DSB] will allow bicycles to travel free on the red S-trains that serve Greater Copenhagen and suburbs. It is a test period that starts this Friday and that will last for the rest of the year. DSB hope to make everyday journeys easier for Copenhageners and encourage more people to use their bicycle. It normally only costs 12 kroner [$2.25] for a bicycle ticket - even less if you buy a ten trip card, as above, but completing removing the need for a ticket will encourage many more people to combine train and bike on their daily journey. All the rules about taking your bicycle on the S-Train still apply, it's just free now. The S-trains have about 7.5 million passengers a month. DSB is not concerned about the increase in bicycles in the specially designed bike/pram/wheelchair compartments. "We have personnel on board to help people move around and rearrange so there is space for everyone. We are very confident that there will be room for all", said Niklas Marschall from DSB S-train. It remains to be seen if the Copenhagen Metro will follow suit. A propos nothing, they have a cool web address: www.m.dk. I love the single-letter web addresses. All in all, Copenhagenize is thrilled about this new initiative from DSB. In other public transport related news, a survey of prices for monthly travel cards in Europe shows that Copenhagen has the third cheapest travel cards for public transport, if you measure it in kilometres travelled. Only Helsinki and Brussels are cheaper. This press release is a bit more vague. There is constant criticism of ticket prices being too high in Copenhagen. It costs 21 kroner [$4.20] for a single journey and while it is only 13 kroner [$2.50] if you buy a ten trip card, the price is much higher than many other European cities, even when you adjust for our higher standard of living. This 'per kilometre' yardstick sounds like spin. Kind of like the 'driving a car is safer 'per kilometre...' statistic that the car industry is so fond of. Which would make space travel the safest form of transport, even though 5% of all people who have been in space were killed, and that doesn't include an even greater number of ground crew. Anyway, Copenhagen has the third-largest urban sprawl in Europe so here's me assuming that public transport users will often travel longer compared to other cities. Which kind of takes the shine off the report. For more bits on Bikes on Trains here on Copenhagenize click here. 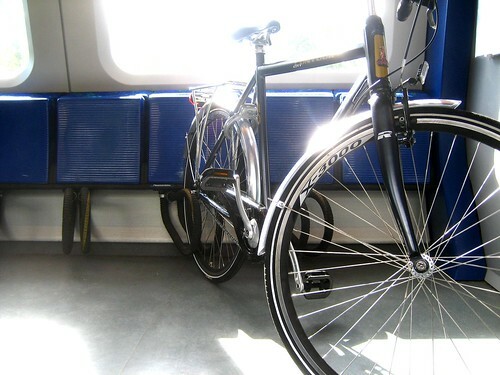 Source for DSB's free bikes on trains.